Improving health outcomes in low-income populations is crucial to slowing rising healthcare costs in developed countries. Significant efforts have gone into driving productivity of hospitals and physicians, implementing checklists to standardize care for populations, and using historical cost data to forecast high-cost patients. Despite these efforts, we are not significantly better off today than we were 10 years ago, and overstretched healthcare budgets, especially for the low income, elderly and disabled, are threatening the financial stability of government balance sheets for generations to come. So, what are we missing? Personalized medicine is often said to be one of the cures to the ails of our healthcare systems. Personalized medicine predominantly uses the genetic makeup of an individual to predict a patient’s response to therapy or risk of disease. However, with genetics accounting for only 30% of health outcomes, are we getting the biggest bang for our buck by investing more in scientific and medical innovation for personalized medicine? Or are there other ways to personalize healthcare delivery that would result in a higher return on investment? 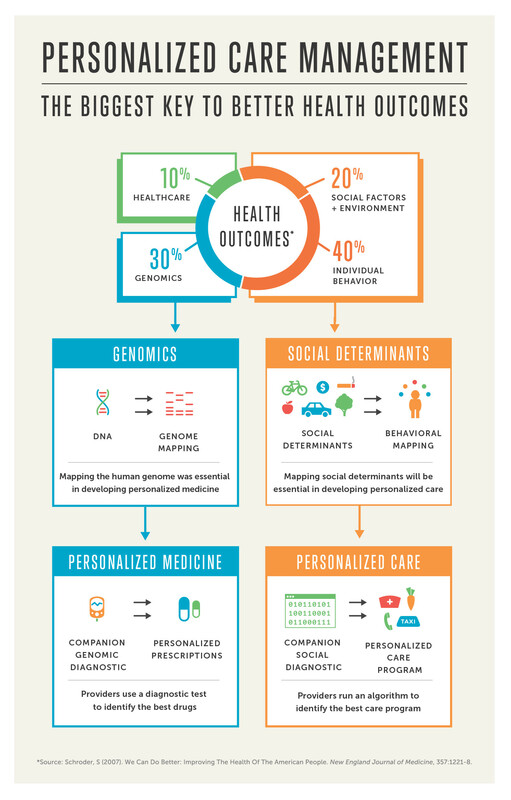 Social determinants of health are to personalized care management, what genes and biomarkers are to personalized medicine. In fact, social determinants of health, including social behaviours and environmental exposure, account for up to 60% of health outcomes and are particularly important drivers in low-income populations. With personalized care management, healthcare providers could systematically incorporate social determinants of health into their care plan and not only customize the choice of medication, but also prescribe non-traditional care. For example, with the advent of food delivery start-ups, why shouldn’t a healthcare provider be able to write a prescription for fresh meals delivered to a patient who is obese and doesn’t have access to healthy food options in their neighborhood? Part of the reason why personalized care management isn’t systematically integrated into healthcare delivery today is the lack of a social-behavioural “companion diagnostic”. In personalized medicine, companion diagnostics try to understand how multiple variations in a patient’s genetic code come together to produce a disease state. In personalized care management, a companion diagnostic would tell the healthcare provider how different social, behavioural and economic factors interact to drive health outcomes for an individual. It is time to apply the proven and successful play book of personalized medicine, that is systematically mapping the human genome, developing and testing drugs based on specific biomarkers, and educating providers, to social determinants of health and personalized care management. Only when we understand how social determinants of health drive disease states, and when we equip healthcare providers with an easy-to-use companion diagnostic can we accurately measure the risk levels of populations, predict high-cost patients, and transform healthcare into a true consumer-driven industry. Lower levels of income and wealth in developed countries are associated with poorer health outcomes and lower life expectancy. Research tells us that social factors, including education, racial segregation, social support and poverty account for over a third of total deaths in the United States in a year. Health disparities are commonly viewed through the lens of race and ethnicity but they occur across a range of dimensions and gradually worsen with lower income. In fact, a person’s zip code is a stronger predictor than genes for a person’s health. The economic impact of poorer health in these populations drives significant healthcare costs and productivity losses in developed countries. 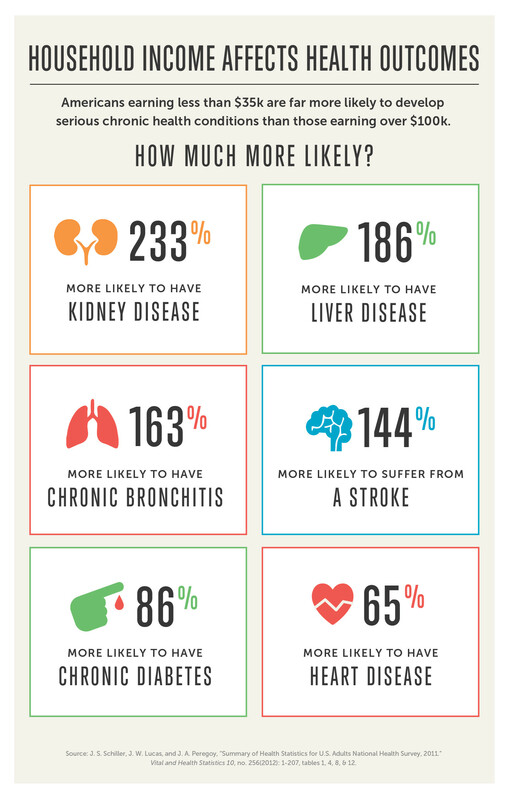 Lower income populations are more likely to generate higher healthcare costs due to their increased risk of illness. Medicaid, the health insurance for low-income children and adults in the United States, is one of the largest unfunded liabilities on the US balance sheet. While a lot of focus has been placed on the impact of the ageing population on healthcare costs, healthcare costs have also been squeezed by the decreasing purchasing power of the low-income population. Health behaviours and environmental exposure, collectively called social determinants of health, play a significant role in driving health outcomes, especially in the low-income population. The fact that social determinants of health therefore contribute to driving avoidable healthcare costs is well established. There are many community-based projects to tackle social determinants of health, ranging from coordinated approaches such as Accountable Health Communities in the United States, to informal social networks in other countries. However, current approaches to tackling social determinants of health are top-down population based, and aim to apply one model to many individuals in an attempt to standardize care and reduce variation. Standardizing care is important to reduce medical errors and ensure everyone receives the best care available. However, just like the genetic make-up of an individual can drive efficacy of a drug, the social-behavioural profile of an individual can drive efficacy of care programmes. Healthcare providers should be able to identify and treat the unique social-behavioural barriers for an individual and integrate actionable insights into the healthcare provider’s workflow. This socio-behavioural companion diagnostic would therefore have the power to turn healthcare providers into providers of health. The socio-behavioural diagnostic tests should be actionable – not only to help healthcare providers better understand the barriers to better health, but also to help them direct what care to prescribe. For example, should healthcare providers be able to prescribe patients with lower access to healthy foods prescriptions for food delivery services to prevent obesity? Prescribe mothers of children in polluted neighbourhoods air purifiers to prevent emergency room visits due to asthma? Or prescribe an Uber transport to get patients to their next primary care appointment? It is known that a small proportion of patients drive a disproportionate amount of healthcare spending. Based on this insight, resources have historically been allocated either to patients who are already sick or patients prioritized based on historical costs. However, less than 50% of patients that were “high cost” in the previous years will be “high cost” in the next one. Therefore, better prediction models based on a socio-behavioural companion diagnostic not only have the benefit of reducing long-term healthcare costs due to prevention, but will boost productivity of existing healthcare expenditure immediately. 1. Governments need to free siloed social data and give access to patient-identifiable data to patient care teams and researchers. 2. Just like providers need education on how to use genomic profile data, healthcare providers need to be educated on how to use social determinants. 3. Healthcare providers need to get better at documenting socio-behavioural barriers to health and the enabling services (e.g. transportation services, nutritional counseling) they provide through the usage of billing codes. 4. Governments need to incentivize insurance companies to pay providers to prescribe non-standard care and reimburse patients for it (e.g. air purifiers). 5. Governments would need to set clearer standards for patient data privacy that are flexible enough to allow healthcare providers to improve the care they provide to patients, while not adversely affecting the patient more broadly. Big data analytics has advanced significantly in recent years. It is now almost at a point where it will be able to make sense of the terabytes of data on patient populations and integrate insights into the workflow of healthcare providers. Doing so could not only improve health outcomes for the most vulnerable populations in society, but also significantly reduce growth in healthcare costs.